I hate high heels. It annoys my moves! The last time I wore one was on my wedding day, and it was 6 years ago. I salute those women who enjoy wearing high heels. Even some are dancing with it! As for me, I don't want to suffer myself with the thing called "high heels". As much as I hate high heels, I love making it on my cake decoration. I found joys everytime I see customer's expression on their face when they saw my creation. - I finished this decoration in 3 nights. First night, made the shoe. The shoe needs at least 2 days to dry (but if you use gumpaste, it'll dry faster). Second night, decorated the cake drums. Third, finishing the whole cake. - I used white fondant, "Black", "Christmast Red", "Rose" and "Rose Petal Pink" icing colors from Wilton. 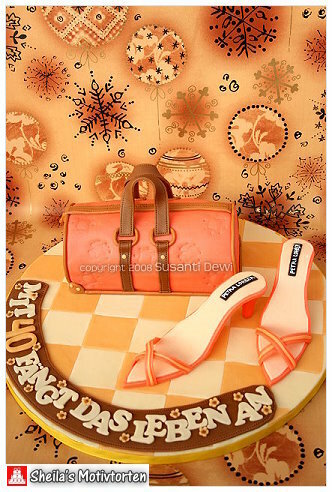 - This cake made in 2009, so mind the copyright's year on the watermark. I was too lazy to edit it :D.
- Still needed 3 days to finish it. I really need to manage my time! - I used white fondant, "Ivory", "Black", "Brown", and "Creamy Peach" icing colors from Wilton. 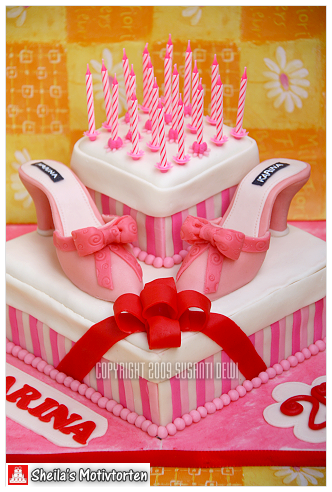 There's one great site that helped me to make high heels fondant. You can check it up at Cake Central. Oh how I loveeee internet. You can find almost everything there! Some people might be stingy in sharing their knowledge and information. Pelit informasi??? Hari geneee gitu loh!! Knowledge is useful if it's shared. Kagum! Terpana.. nggak bisa ngomong, ck ck ck.. keren abis! Terampil, sabar dan telaten dirimu Sheil..